In an earlier post, I wrote about how maker’s marks on ceramics can help us figure out the date of specific artifacts. If we can match the mark on a piece of pottery to those listed in a book like Godden’s Encyclopedia of British Pottery and Porcelain Marks, we can figure out its date. Godden’s encyclopedia was intended for collectors, though, and works on the assumption that the entire piece is complete and the full mark is present. If part of the mark is missing, the whole prospect becomes a lot more challenging, because we can’t simply look up that maker’s name. We’ve found several partial marks on the site, such as the one shown to the right. This is a blue transfer-print mark that shows part of a distinctive circular belt called a garter mark. Inside the garter is the word “TUNSTALL,” which is a placename related to some potteries in Staffordshire; just below the garter is a partial word that I at first interpreted as “_OLAND”. I was quite puzzled by what that could mean, until Kate pointed out that what I was seeing as an “O” was actually a “G”. So the word under the garter is “ENGLAND”. Given that the maker’s name is missing, my best bet was to page through the 4515 entries in Godden to see if I could find a mark that matched. Lo and behold, mark 3204 was a good match– though not a total match. The key was in the shape of the buckle and the end of the belt; unlike most other garter marks, our sherd and mark 3204 are quite bold, with a distinctive fold where the belt crosses over the bottom of the circle. Godden reports that Mark 3204 was used by T. Rathbone & Co., of Tunstall, from c. 1898+. 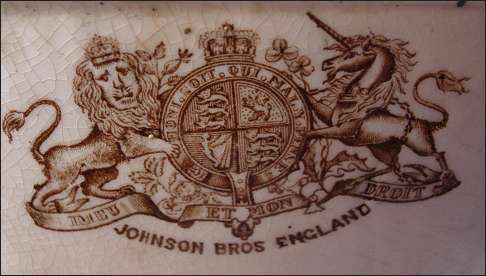 The difference is that our sherd has the addition of the word “ENGLAND” at the bottom, a feature that was common after 1891 due to protectionist tariffs in the United States that required that imported goods be labelled with their country of origin; by 1921, the requirement shifted to a label “Made in __” and then the country name. Taken together, this information suggests that our sherd is from some time after 1898 and before 1921. …and, like our sherd, the mark is on a Blue Willow pattern plate. The museum notes that the mark was used by Bell from 1850-1870. Finally, we have this very fragmentary mark, which shows part of the Royal Arms. The full coat of arms shows a lion and a unicorn on either side of a shield displaying the royal symbols of each part of the United Kingdom: lions for England and Scotland and a harp for Ireland. Technically, manufacturers had to have royal permission– a Royal Warrant of Appointment– to use the Royal Arms, but somewhere in the neighbourhood of 2000 companies were given permission during Queen Victoria’s reign, so it wasn’t unusual to see the Arms on ceramics. If a company didn’t have a Royal Warrant, they might use a closely related mark that gave the impression of the Royal Arms, without copying it directly; there are some good examples at this website. The details of the Royal Arms varied a bit in style over time and from manufacturer to manufacturer. In the case of our sherd, the central shield is oval, rather than the more common circle, and the leg of the rearing unicorn (to the right of the oval) comes in at an unusual angle. In addition, this mark includes the first part of the motto (“Hon y soit qui mal y pense” or “Shame to him who evil thinks”), visible as “_MAL Y P_” at the upper right. It’s not clear if the second part, “Dieu et mon droit” (“God and my right”), is absent or if it would have been placed below the shield on a banner. It’s a shame that we don’t have just a bit more of our mark, as the differences in the faces and postures of the lion and unicorn can be really useful in identifying the right mark. These examples will give you a sense of some of the small variations. This Royal Arms has an oval garter and shield in the centre, but different posture from the unicorn. This mark has a circular garter and shield, but the unicorn’s leg meets the shield at about the same angle as in our mark. The Royal Arms could get quite elaborate, as in this example. I love the pensive look on the lion’s face. As archaeologists exploring a new site, we’re initially focused on figuring out 1) what happened and 2) when. Our questions will become more interesting as we learn more, but for now we need to determine the basics: how the walls at the site add up to a structure (or possibly more than one), when it was built, what kind of building it is (a house, or something else?) and when it was in use. We may be able to estimate a date range based on the style of a piece, much the way that a keen car enthusiast can distinguish between a classic Mustang and the modern version. We may use information about when a particular manufacturing technique was invented, so that, say, a glass bottle with particular kind of scar on its base must date to after 1905, when the machine that leaves that mark was first used. We may find markings on the artifact that identify the manufacturer and allow us to determine the approximate date of a piece. Such marks, called maker’s marks, are fairly common on ceramic tablewares like plates and cups and tea pots. The marks vary considerably. They might include the manufacturer’s name, images or logos, place names, pattern names, the year that the company was founded, and so on. 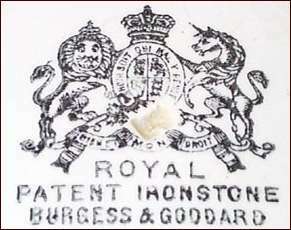 In this particular case, the mark consists of an image of a crown with the manufacturer’s name (Taylor & Kent) and location (Longton, England). Manufacturers changed their marks fairly often, adding different bits of text or changing their logos– a stroke of good fortune for those of us who want to date these things. All we have to do to date the piece is to know when each company used each mark and when they switched to the next variation. My copy of Godden is getting rather beat up, but that’s okay with me; it gets a lot of use. Godden’s book, like other dictionaries of marks, is a painstakingly compiled list of pottery manufacturers, the marks that they used, and the dates that each mark was in use. To determine the date range for a piece of pottery, you simply look up the maker’s name and find the mark that matches the one on your piece. For example, Godden lists Taylor & Kent as one of the Staffordshire potteries, based in Longton, that began doing business in 1867. Then he provides six different marks, each used in a particular time frame. Six different marks used by Taylor & Kent, Ltd. The mark on my saucer matches number 3810, the one in the upper right, with a date range of circa 1912+. That means that the saucer could have been made any time after about 1912. It also implies that the saucer might be before ca. 1939, when the rearing horse mark came into use, but that’s not certain– manufacturers might use different marks at the same time, but on different pieces or patterns. We can see snippets of images, as well as a few words, on each sherd, but it’s an awful lot more difficult to deal with marks when we don’t have a manufacturer’s name to look up! Still, with a bit of persistence and a lot of patience, we can often match even these fragments to a particular maker’s mark. I’ll explain more about how we find a match for such fragments in a future post.